Contact person: Professor Annika Härenstam, phone: 46 (0)31 786 61 40. Personal web page. On January 1, 2012 the Department of Sociology and Work Science was founded by the merger of the Department of Sociology and the Department of Work Science. The Department of Sociology and Work Science aims to promote, carry out and develop interdisciplinary research and education in the field of Work Science. An extensive amount of activity within the department is commissioned and evaluative work. Prof. Annika Härenstam has been a professor at the department since 2007. Before that she was Professor in Work Organization, MTO, at the National Institute for Working Life in Stockholm (NIWL), an institution that closed down in 2007. At NIWL, researchers were actively working with India related projects, and these contacts have now shifted over to University of Gothenburg. More information about the India projects at NIWL. 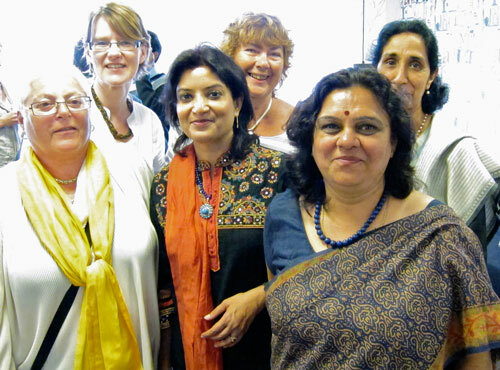 SIGN network being formed at the June 2011 Gothenburg meeting, from left to right: Hanna Westberg, Karin Allard, Amita Sahaya, Annika Härenstam, Sunita Kaistha and Surinder Jaswal. Another founding member of the network, Birgitta Jordansson was not available for the photo. A formative meeting was held in Gothenburg in early June 2011. As a first step, SIGN had invited researchers from related fields to discuss potential research cooperation/collaboration at this meeting that was attended by 25 researchers. Besides Prof. Annika Härenstam, the main Swedish networking partners are Dr. Birgitta Jordansson, Head of department, Dept. of Work Science; Associate Professor Hanna Westberg, previously researcher at the National Institute for Working Life (NIWL) in Stockholm; and Dr. Karin Allard, Dept. of Psychology, University of Gothenburg. The Indian main coordinators are Associate Professor Sunita Kaistha from Jesus & Mary College in New Delhi, and Dr. Amita Sahaya, founder secretary of the New Delhi based non-profit organisation Women Work & Health Initiative (WWHI). Dr. Kaistha also happens to be the WWHI President. Other Indian partners in the network are Professor Surinder Jaswal from Tata Institute of Social Sciences (TISS) in Mumbai (also a partner in the Go:India project that also was launched in early June 2011 with a kick-off conference in Gothenburg – more information), Professor Vibhuti Patel, Shreemati Nathibai Damodar Thackersey Women’s University (SNDT) in Mumbai, and Professor Urmi Nanda Biswas, University of Baroda. The SIGN network aims at facilitating collaboration in research and an exchange of knowledge between universities, organisations and corporations in India. The focus areas are gender, management and improvement of health in working life. 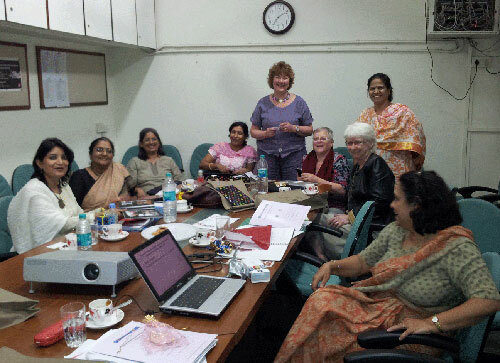 Annika Härenstam, Birgitta Jordansson and Hanna Westberg went to India in early 2012, for a first meeting with the network’s steering committee (Photo from the first meeting of the steering committee). Two workshops were held with approximately 20 researchers in Mumbai and New Delhi, and a reception was organised at the Swedish Embassy, that was attended by representatives of the Swedish Agency for Growth Policy Analysis (Tillväxtanalys), Swedish Chamber of Commerce, and NGOs working in India. These contacts are considered to be important in order to enhance future collaboration between academics, business and civil society in India and Sweden. The next step will be to link up researchers with common fields of interest in the two countries, especially at University of Gothenburg. SIGN intends to organise conferences and seminars, initiate research projects, and exchange experiences and methods with Indian colleagues e g regarding equality of opportunities for men and women in working life. During their June 2011 stay in Gothenburg, Sunita Kaistha and Amita Sahaya gave a lecture to the students at the Department of Work Science, on ”Gender & Labour Market in India”. They also gave seminars at the Department of Sociology on the subjects of: ”Gender Diversity & Inequality in the Labour Market in India”; and ”Gender Roles & Livelihood – a Critique”. Dr. Denis Frank works on international migration, labour markets and political sociology. He has examined how the Swedish state and employers shaped labor migration to Sweden during the 1960s and 1970s. He has examined the labor migration from Eastern Europe to Sweden since the 1990s, and how trade unions have responded to this migration. He has, furthermore, made a comparative analysis of the Swedish immigration policy that was implemented in 2008. Personal web page. In October 2012, Denis Frank received SEK 2.6 m as a grant from Riksbankens Jubileumsfond for a three years project entitled ”Globalization of Migration to Sweden: The Labor Migration from India and China 2008-2014”. Along with the researcher Chia-Ling Yang, he will explore the increased labour migration from India and China, how this migration started and what lies behind. The contact person on the Indian side is Amita Sahaya, founder secretary of the New Delhi based non-profit organisation Women Work & Health Initiative (WWHI), and a member of the Sweden India Gender Network (SIGN) – see above. Abstract: Sweden introduced a new immigration policy in 2008 – the most comprehensive immigration reform in 40 years. The new immigration policy encourages labor immigration from countries outside EU. The new immigration policy has promoted a globalization of migration to Sweden. The globalization of migration refers to the fact that the number of sending countries has increased, and that migrants originate in a larger number of source countries than previously. The migrants originate in countries at larger geographical distance from Sweden. In earlier periods of labour immigration, the main share of migrants originated in European states, but this pattern changed after the immigration policy reform. Since 2008 the largest numbers of migrants instead comes from Thailand, India, and China. This research project will examine the migration from India and China to Sweden. The increased migration from India and China is a new migration pattern. Sweden received only a small number of migrants from these countries before 2008. There are furthermore no historical ties to India and China that can explain the migration, for instance former colonial ties. The aim of this research project is to explain how the new migration pattern has been initiated and established. Read more.